Her favorite addition is the “breaking data” feature, which tells you all of your top keywords driving traffic to the site. You can use this to see terms that gain a high volume of impressions but a low volume of clicks. From this, you’ll know that the page can be optimized better to potentially get more clicks. And it doesn’t even have to be on page or changing keywords. Sometimes, just testing changes in meta description can help gain additional clicks. It’s something we have control over and can see near immediate results for changes. Leverage meta descriptions for clicks, and to help promote your brand and spread key messages. Have you given access of webmaster tools to members of your team? You should consider this so they can act on data. Additionally, branded searches and navigational queries are extremely valuable for a brand and should not be discounted. At the WSJ, hundreds of thousands see our search result monthly from brand terms. Alex then proceeded to speak on sitemaps. She noted, if you have a large enterprise level site with frequent information that’s added/deleted, a sitemap is vital. That’s because you don’t have to wait for search engines to re-crawl your site, you’re providing it to them in a format they’ll immediately get. At the Wall Street Journal, we organize our sitemaps into specific types of content – i.e. stock queries, articles, etc. Then we can see immediately when problems crop up. In terms of getting “old school” reporters to create additional content, like to help them see the value of SEO by showing examples of their own content. For example, I find a headline they wrote and show them how not at all findable in search, whereas others are easily findable. By showing examples, Alex is able to be persuasive and help reporters create SEO friendly content. Brian spoke on the balance between search, and how search interacts with usability. 1. The searcher’s expectation for what they think they’ll find must be met. 2. Information must be presented to enable a decision or make choices. 3. The next steps must be clear. 4. The entire experience must feel safe, secure, authentic and believable. SEO Tip #1: Use a keyword oriented tagline with the “Who” and “What answered. When is the next release for “keyword”? Why are you an expert on “keyword”? Asking these questions helps generate fresh content, better defines anchor text, provides new ideas for navigation text link labels and increases understandability for humans, search and those using assistive technology to interact with your website. Be consistent, use the same address and phone number across the web. Monitor and manage you and your competitor’s reputation. 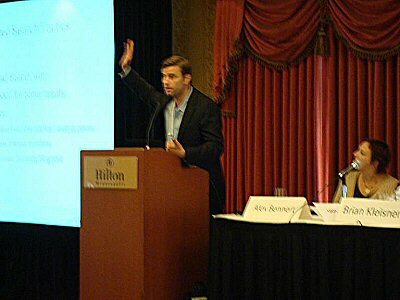 Bill spoke about integration opportunities between Search and other marketing tactics. He started by speaking at a high level, and that “more arrows are generally good.” Marketing works best when it works together. As we talk about ways to improve search, remember it is just another piece of marketing. Start by defining what you really want from your marketing efforts and create a key objective. Bill then shared integrated tactics that will improve ROI of search. 1. Integrate paid media and “earned media” for better results. 2. Consider event and name driven paid and natural search. Leverage a national events and names for dirt cheap search traffic. 3. House list/direct mail tie-ins: integrate online marketing with more traditional focused direct marketing (think online mail-merge). Most B2B terms are not looked at “for fun” they are looked at due to pain points on the part of the searcher. 5. Improve spending by using down-funnel data. One client was spending 110K per month with well understood and optimized CPL metrics. They started doing PPC optimization using human scrubbed lead data (not web forms). Results: 43% shift in PPC spend allocation, 31% software sales uplift. 6. Choose keywords on conversion metrics, not on search/reach/volume metrics. If you have paid search data, use that to determine what the money keywords are. Thanks for the awesome–and unconventional–SEO tips. It's amazing how much SEO advice you read, but you don't read very often to write your meta description to entice more clicks. I have personally written my descriptions keeping the searcher's view in mind, but I rarely read that advice elsewhere. I think the majority of everyone is yet to discover the true power in analyzing your webmaster tools statistics (myself included), so this post is definitely a great start… and a great kick in the rear to start moving forward with it! This site is very good. there are so many great articles. Thanks Chris, what would you like to see more of? Very interesting, especially 5th point – I often review my website looking at Funnels in Google Analytics, it's way more exciting on big ecommerce websites, and if you can improve your clients spending, using this data, and give him more clients for the same money, that's really worth it. I wish I was at this conference. It's a shame that in England we don't have many of them, and if they do, they're very expensive. Focusing on the SEO part, I find Brian's words very helpful and informative. I learned from reading articles online and blog comments that many people most likely entertain and go to sites which are easily accessible and helpful for them in terms of content and web design. I also agree on the second tip. Since we are in the business of search engine optimization, we also need to optimize the choice of the keyword we will be putting on the web so even with those few words, visitors can have an idea on what the site is all about. Here's a good example: SEO Orange County. The keyword contained the “who” and the “what” of the business; in that case, SEO which also includes web design (Orange County), and Orange Country, which in turn also includes other localities as its scope of operations. I'm really impressed with the web site in terms of the design and its content. These changes to Google webmaster tools certainly do provide an insight that you couldn't previously get from your Analytics. Thanks for sharing. The truth about search is the user is in a different mindset. The search user is already looking for something. Suppose someone visiting a web site is probably looking for something else, and you are now trying to get them to look at your product or service. At that time above points of discussion really helps us.